And you got nothing for it. Fox News going all anti gun with the announcement. Pro gun people did not get in front of it and now loses. I can't find this anywhere. Can you link to a source? I'm curious to know the specifics like bump stocks only, or any "rapid fire devices" like clothing / ties, also is this retroactive / confiscation? Google "Trump Sessions Bump Stock"
No surprise there and guess what.....it's gonna' get worse before it gets better. Look for high (?) capacity magazines next. Last edited by TexasJohnBoy on Tue Feb 20, 2018 4:40 pm, edited 1 time in total. Do I have to cut my belt loops off now? Is there anything on Trump actually signing a ban? Or is this just an order to develop regulations? If they are just drawing up regulations, then we will need to wait to see what this means. Are they going to ban everything that could be used for bump firing, or just a specific type of stock? How do I register a piece of plastic with the ATF? Do I get a tax stamp for it? Is it only an issue once it goes on a firearm? What will the process be for getting an NFA stamp? When is this effective? Is it retroactive? If it is retroactive, am I required to dispose of legally owned bump stocks in a specific manner or can I just toss them into a lake somewhere? Is this the end of legal shoe laces, string, belt loops, etc., or can I continue to bump fire all I want using things other than a specifically designed stock? Enforcement will be another can of worms altogether. If this includes "all" devices that could be used to facilitate rapid fire, then how do I get Pelosi arrested when she shows up on TV wearing something that meets the definition? That might actually be fun. Oi vay. 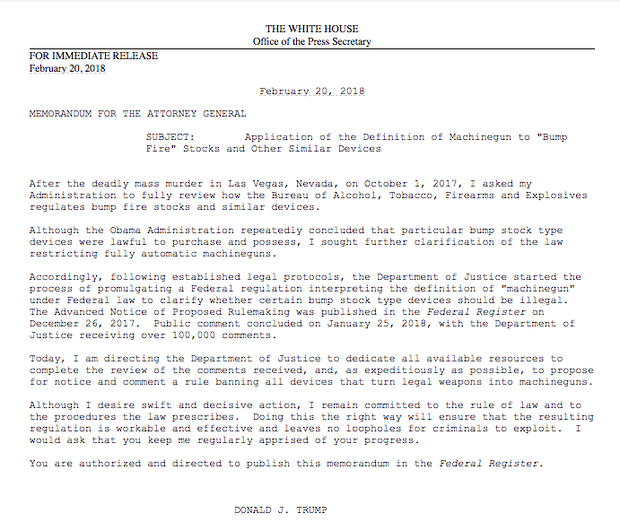 He signed a memo that makes a recommendation. Any other news to report from the Chicken Little Newsdesk of Hyperbole ? Apparently stock analysts and big investors don't believe anything will actually come of this since Ruger's stock is down almost 4% today. I can also find entry level AR's for sale at just over $500 on Buds. If there is any truth to the hysteria, it hasn't led to panic buying. Yet. Look again, that memo bears today's date. You also may note the use of the word "immediately'? The only "immediate" I see is "for immediate release". Is that what you are referring to? So, If Obama administration said it is legal, nothing changed to make it illegal.